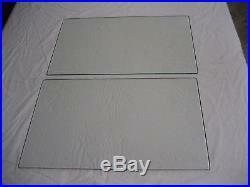 NEW CLEAR DOOR GLASS SET FOR 1928-31 FORD MODEL A TUDOR, SET INCLUDES 2 PCS FOR RIGHT AND LEFT FRONT DOOR. ALL GLASS IS CUT FROM ORIGINAL FORD PATTERNS AND SPECS, EDGES ARE SANDED TO AN ORIGINAL SATIN FINISH GUARANTEED TO FIT EXACTLY LIKE YOUR ORIGINAL GLASS PARTS. ALL OF OUR GLASS IS GUARANTEED AGAINST DEFECTS AND WORKMANSHIP. WE CARRY CURVED WINDSHIELDS, BENT TEMPERED SIDE AND BACK GLASS AND HAVE A COMPLETE SET OF OEM FLAT GLASS PATTERNS THAT WE CUSTOM CUT IN OUR SHOP FOR YOU CAR OR TRUCK. NOTE: WINDOW GLASS SEALS ARE NOW AVAILABLE PLEASE INQUIRE FOR AVAILABILITY AND COST. The item "1928,1929,1930,1931 MODEL A FORD TUDOR DOOR GLASS" is in sale since Thursday, April 14, 2011. This item is in the category "eBay Motors\Parts & Accessories\Vintage Car & Truck Parts\Glass". The seller is "silex210" and is located in Tolland, Connecticut. This item can be shipped to United States.